I got bored tonight and decided to gather up some scrap materials I have on hand and I began the process of making a handmade copy of Ponte del Diavolo. I’ve only ever manufactured a copy of a game once before when I made a copy of Hive . With Hive, after many, many hours, I had a copy of the game that originally cost me less than $25 for the real deal in the first place. So, no, this isn’t about possessing the game. If it was centered on owning a copy, I’d just buy one, a much simpler and much more cost effective approach. Instead, it’s about the process. The tactile aspects of handling the wood, shaping the textures, smoothing the cherry and white oak tiles, and drawing my gaming hobby towards a common goal with my other favorite hobby, woodworking. 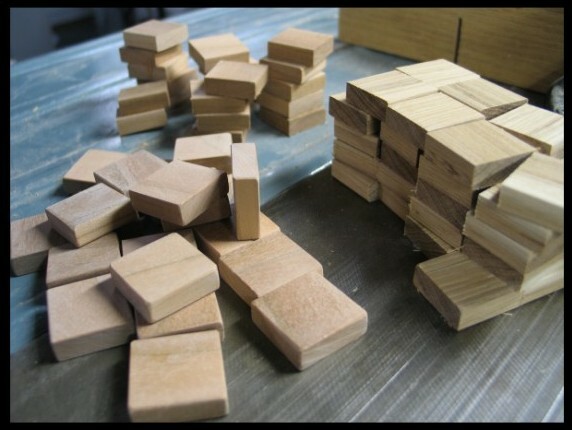 On the left are some of the cherry 1″x1″ cherry tiles I cut out that have had an initial amount of sanding. Behind those, are some cherry tiles that have yet to be sanded. On the right are the white oak tiles for the second player. They’ve not received anything beyond cutting. My plan is to stain the white oak tiles very dark, to leave the cherry tiles natural, and to seal all of them with a satin poly top coat. I haven’t a clue what I’m going to do for the bridges yet. For the board, I plan to use a 10×10 tile sheet of 1″x1″ white unglazed mosaic ceramic tile left over from when I installed the flooring in our bathrooms. I’ll mount and grout that into a frame for the board. That’s the plan anyway. It may take me many months to finish it but I’m not in a hurry. Wish me luck. I maintain a list of games that cross my radar. There is an ebb and flow to the amount ofeffort I put into the list but some recent images from Essen have gotten me to scribble downsome items for further study. As you can see the list is barely formed, in no particular order,and has little to no data yet. Thought you might like to see what’s interesting me at themoment. Andreas Resch posted some superb images from the Essen Game Fair in Germany last week. Take a peek at some of the 376 images he chose from his 900+ shots. I received Bonaparte at Marengo as a Christmas gift back in 2005 and I really wanted it. It didn’t help that I talked to Bowen Simmons at Origins earlier that year. He’d convinced me that I should dip my toe in the wargame waters and so I put the copy on my wishlist, Lisa picked up a copy for me, and there it sat gathering dust. So, after two great trade experiences on BGG, I started looking for a good candidate for a trade and I think I found it in a copy of the (German) Amigo version of Union Pacific. UP is out of print and although the Rio Grande Games version is next to impossible to find and very expensive on eBay ($80+), the Amigo version is somewhat easier to find and runs in the $60+ ballpark. 999 also carries a Dutch copy that apparently is easier to find but I couldn’t locate one myself. 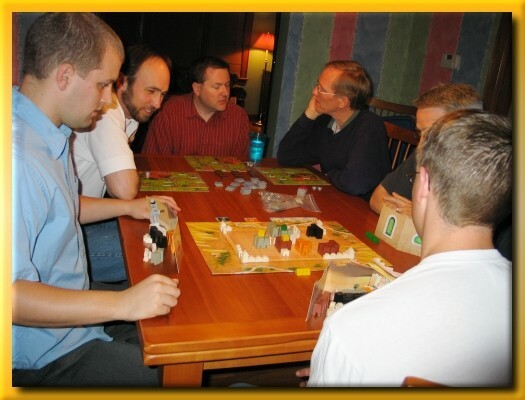 UP was designed by Alan Moon, a two-time winner of the Spiel des Jahres and the designer of Ticket to Ride. The game is a stock market/set collection game at its heart with players attempting to ‘invest’ in the railroad that pays out the largest total dividends over the course of the game. 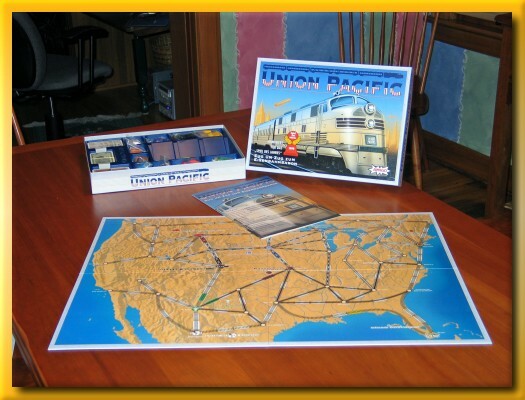 Players place cards to build track and place trains to extends railroad routes across the map of North America. Players must also choose to skip expanding routes to invest in specific railroads. In the end, the player who has collected the most money from investing in the right railroads will win the game. Even after many years, UP still holds an amazing 7.52 rating on BGG and I’m reallying looking forward to my first play. My latest image submissions to BGG involve Amazonas. Here are the links to bothof my submissions. A few weeks ago I submitted a group of textual T-shirt ideas to a contest being sponsored by MeeplePeople.com. Given the quality of the contest submissions in more than 340 postings in the BGG forums, I didn’t expect to win anything but I had fun trying to think up ideas. Tonight, however, I was notified that I won 2nd place for my “I Survived Analysis Paralysis” entry and for that, I not only receive a $20 gift certificate but a lifetime 10% discount from the website! We met at my house for the October session of Analog Game Night (AGN). I thought it was going to be lightly attended but we started the night with six! An hour into the night we traded a regular player who had to leave early for a first timer to our game group. Welcome Bob G.! Since we knew Bob would be coming later we broke into two groups for two shorter games. The far end of the table played Zooloretto while my end of the table played Medina. I’d only played Medina with my kids and welcomed the chance to play against those in my game group. It definitely had a different flavor that only enhanced my rating of the game. The game plays extremely quickly with three. In most cases, the two pieces you play on the board are easily chosen but at times it’s agonizing trying to decide what to do. You have to keenly monitor the position and size of unclaimed palaces in hopes of getting other players to commit early while still leaving room for you to begin a new palace with room to grow. You need to plan to save some of your walls, inhabitants, and stables for the game end so that your opponents are forced to increase the value of your palace by placing the blocks they held back. It’s a great ‘filler’ game for those 45 to 60 minute spots. Unfortunately, I didn’t get a chance to participate in Zooloretto (I have yet to play) but it looked like everyone was having a good time trying to decide what to do with the animals in their zoo exhibits. Zooloretto uses the same core mechanic as Coloretto for players to collect animals and coins. Once collected, you position animals in exhibits but you must plan your zoo wisely so that you don’t run out of room. 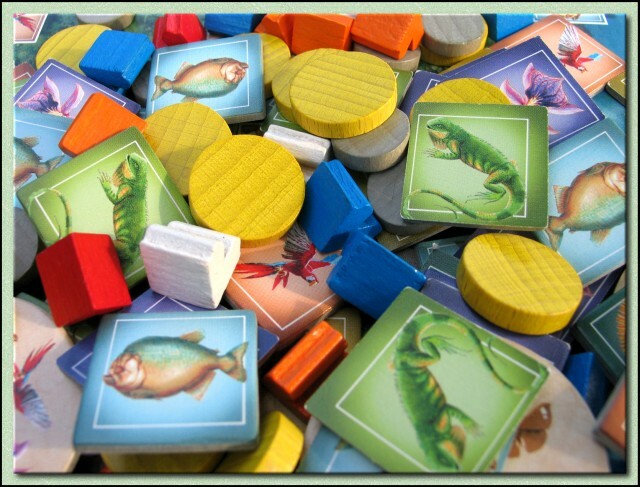 Zooloretto won the 2007 Spiel des Jahres usually given to family friendly games. If you’re looking for lighter family fare, take a look at this title. Paul K. (far end of the table) was concerned about having to leave early so he decided to sit out leaving five for our longer game of the evening. We decided to give Notre Dame a go. Notre Dame isn’t as complex as Puerto Rico or Caylus but it is considered a medium weight game when compared to available Eurogames. I was a little concerned about inflicting the game on a new gamer but Bob G. (far left) did a great job of keeping up with the rules run-through and played very respectably for his first time out. We were all new to Notre Dame so the initial rule run through took a little bit of time fielding questions and consulting rules when necessary for the items I couldn’t remember. I take personal pride in teaching a game well and under most circumstances I won’t teach a game until I’ve at least played a few sample rounds or have recently refreshed my memory by reading the rules again before game night. Teaching a new game is a blog entry or two by itself so I’ll set that aside for another time. Initially, the iconography is a little daunting but after a round or two it’s easy to recognize what your options are. 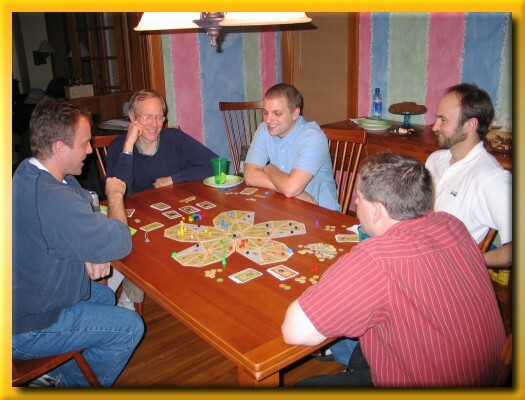 Like Caylus, turns are comprised of multiple phases that require numerous trips around the table. This game feature decreases down time between turns giving you the impression that it’s almost always your turn. At a high level, players use action cards across nine rounds to place cubes into one of the seven regions of a lobe of the city dedicated to a particular player (see the image above). The board uses a clever hub and spoke technique that allows the hub (depicting the cathedral) to be swapped for a square for two or four players, a triangle for three players, and a pentagon for five players. The regions of the lobe grant the user different benefits ranging from income, victory points, movement of a carriage around the lobes of the city, protection from plague-ridden rats, etc. Cubes can also be played in the cathedral for a shared payout of victory points. In the end, the player with the most victory points is the winner. Players must manage income so that they can make offerings to the church and to hire the help of people granting special actions and resources. Players must must also manage their ever decreasing supply of action cubes, the flow of victory points, the impact of the plague, the movement of their carriage on trips through the city, and the position of their trusted friend who helps augment the effectiveness of an action. All of these aspects make the choices sweetly agonizing and I greatly look forward to my next play. Notre Dame has enough variables in the flow of the game that I suspect that each game may play quite differently. I also, however, suspect that it suffers from problems of players being able to benefit from sitting before or after a weaker player. I haven’t experienced that first hand but since passing cards is one of the few ways to impact other players, choosing poorly can greatly impact what the player to your left can do. Until that time, however, when all of its faults and foibles becomes apparent, I’m just going to sit back and enjoy it for what it is…a great game.